Now that I’ve got a couple weeks with The Taken King under my belt I have a handful of Exotic weapons and armor in my inventory. It’s a good mix of Year One and Year Two items, which I think is how most players’ inventory is shaking out so far. So with that in mind, I thought we’d talk a little about those exotics that I’ve actually had hands-on time with. That unfortunately means no Touch of Malice or Black Spindle quite yet. We’ll start with weapons – which is where I have the most variety. This is also where the least amount of variance between the Year One and Year Two versions of items is. There really isn’t a whole lot that can happen different within weapons – a Year One Bad Juju behaves pretty much exactly the same as Year Two. In truth, the only real changes I’ve seen I think are much more related to the 2.0 Patch weapon rebalancing. So with that in mind, we’ll focus more on the Year Two weapons – just know that for the most part any Year One weapons you liked that came with us will still work just fine. I’ve gotten hold of three brand new primary Exotics – two auto rifles and a scout rifle. The two auto rifles both are similar in terms of archetype, but with their individual talents behave very differently. The first I got was the Titan exclusive Fabian Strategy from the Gunsmith. This is an interesting Exotic – in that it really doesn’t feel particularly exotic. Instead it’s talent grid just makes it a really strong, reliable weapon. It’s a workhorse gun – doesn’t do anything super fancy, just kills lots of bad guys dead. It is currently bugged – the Front Lines perk doesn’t actually increase your fire rate right now – but even without that, it’s still a really solid choice for primary. Big clip size, it keeps you healthy with Life Support and does extra damage with Crowd Control – it’s everything you need in an auto rifle, and a perfect Titan weapon. The other auto rifle – the Zhalo Supercell – is on the other side of the spectrum. It’s an Exotic that actually feels exotic, thanks to the electric bullets. The unique perk that allows the bullets to chain Arc damage to grouped up enemies helps keep it feeling special – and also helps clear out groups of low tier enemies. The other unique perk pairs well with that talent – double kills charge your super and give you ammo back. If Fabian is Ol’ Reliable, Zhalo is the flash that you need every once in a while. It’s not a gun I would use every mission, but when I do, it just is cool. The only new scout rifle I’ve used so far is the Boolean Gemini – a quest reward from the Reef. 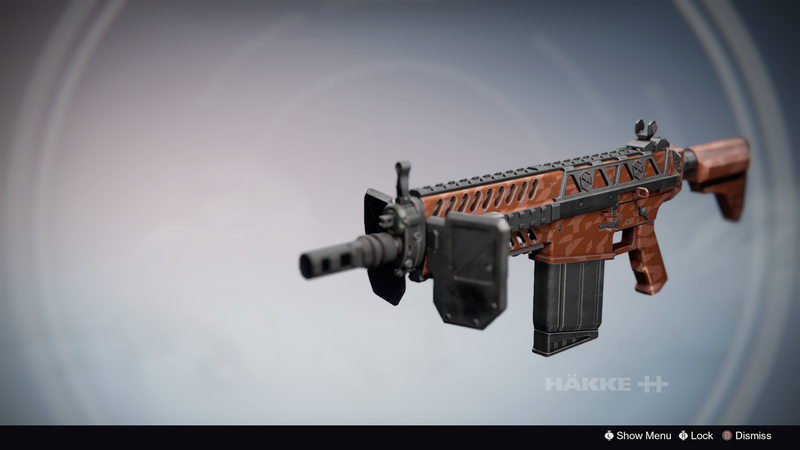 It’s got a lot in common with the Fabian in that it’s not a particularly exotic Exotic. Sure the bullets have a real weighty sound behind them, and look pretty, but the actual behavior of the weapon isn’t particularly outrageous. That doesn’t mean it isn’t great, but it doesn’t stand out to me. The unique perk is actually a binary set to choose from – one rewards precision kills with extra agility, and the other reward body shot kills with extra armor. In other words, you’ll be getting extra agility, because why would you not be getting headshots with a scout rifle? Since it’s a relatively easy weapon to get, I think it’s one that everyone will have at some point, just don’t expect to keep using it. In terms of Special weapons, I’ve only gotten one new exotic – and access to Invective through the kiosk. The new exotic I have though is the new sniper rifle – Hereafter. Hereafter is a mixed bag to me – it’s got some real good parts, but I think it falls down a little when compared with other snipers. One thing that I’m not a huge fan of is that it’s Arc damage – I would have really liked to see a Void sniper show up as an Exotic this year. In general Void damage is pretty rare in exotics in that Truth is the only one from Year One. Where I do think that Hereafter will shine is in low pressure situations – strikes, daily missions, patrol – that sort of stuff. I don’t think that it really is a Nightfall/Raid weapon just because the unique perks just don’t fit well with tough enemies. The big one is that precision kills have a (really good) chance to blind nearby enemies. With only four shots in a magazine, that means you need to make sure that you’re getting kills – and in those high level activities, enemies that can be one-shot are a bit more rare. It’s a messing around weapon – just one that happens to look and sound really cool. If you can get your hands on Hereafter, I think you’ll like it, but also see that other weapons do the same thing it does without taking up the Exotic slot. We’ll move on to armor now, because I have yet to get my Exotic sword, so no new Heavy weapon. The Armor is where there’s a little variance with Year One and Year Two. The biggest one that I’ve noticed is with the Insurmountable Skullfort Titan helmet – it used to just spawn you with melee energy and give you Transfusion. Now it also gives you a second melee charge (unless you’re a Defender right now). But in general, most of the Year One items are pretty much the same – just with their unique perks moved to be intrinsically unlocked. So we’ll focus again on the new items for Year Two. I’ve got one for each: my Titan, Warlock, and Hunter. And because Titans are the best, we’ll look at that one first. 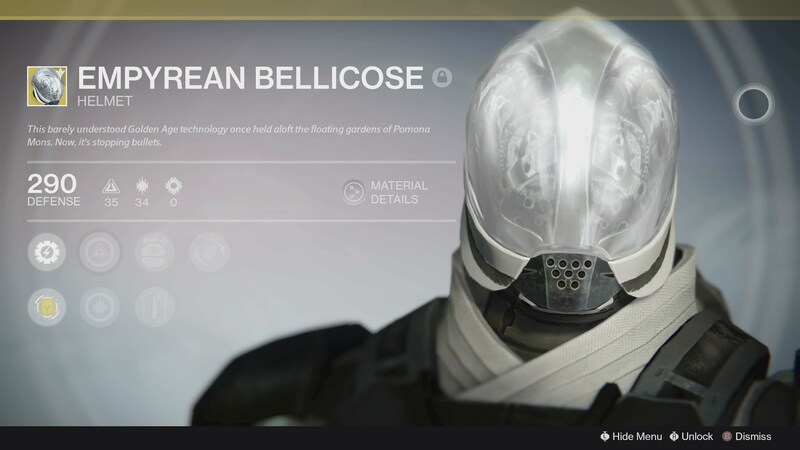 I managed to snag the new Empyrean Bellicose. I initially thought this was one of those Exotics that is only good for a shard. In practice though, I’ve been really enjoying using it in the Crucible. Its whole shtick is that it essentially gives Titans Angel of Light – letting you hover in midair while ADS. It’s a really niche perk, but I gotta say – in PvP it netted me a bunch of kills the other night that I don’t think I could have without it. It’s not a top-tier helmet at all, but it’s a fun one to play with. My Warlock has the Impossible Machine gauntlets – the only Stormcaller specific Exotic so far. It might be the only option, but I think it’s a PvE no brainer. It gives you Landfall – the AoE attack for Stormtrance, which means that you are free to take either Superconductor or Ionic Blink. In PvE, Superconductor plus Landfall is a genius set – AoE safety, and extra chaining damage. If you’re playing Storm Caller, this is definitely the way to go. Finally, my Hunter has the new Sealed Ahamkara’s Grasps. These are essentially the Hunter’s Skullfort – you get a second melee charge, as well as a chance to reload your primary on melee kills. That second part seems pretty nice, but the double melee is where this really shines – and only with Nightstalker does the true use really show up, thanks to the sheer power of the Vanish node for Smoke. It’s a giant safety button, and having two ready at just about any time is undeniable in its utility. So of the new Exotics that I’ve gotten to use so far in The Taken King, I really think that Bungie has the right plan. A lot of what has been going on in TTK so far has been a much more clear focus on specialization. There aren’t a lot of broad stroke items that you can use for everything. The ones that are still there aren’t based around vertical power gains, instead they just keep you in the fight more. As was the case in Year One, these are still the items that we will be chasing down – so get hunting. Yesterday we talked about the Exotic rarity weapons in the first year of Destiny, as we get closer to the launch of The Taken King and the start of Year Two. Today I want to continue the Exotic tour, with a post each day this week on the Exotic armor options for each class. There are plenty of different Exotic tier lists out there, that have gone through each armor piece in a bit more detail – my thought here more to offer an overall look at each classes’ options. We’ll talk both form and function with the armor, something I touched on yesterday with the weapons. We’ll start with the best class: The Titan. Let’s start at the top – the helmets. There are a pretty good number of options here for Titans to go collect, three that benefit the Striker subclass, the other two help the Defender. Strikers, despite have more options here, I think they don’t really have any one that is particularly amazing. 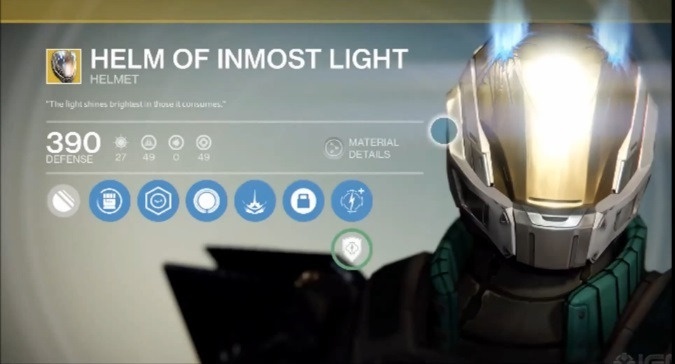 I’m a huge fan of the Helm of Inmost Light – from a design standpoint, it’s one of the coolest pieces of armor out there. The light bursting out through the helmet just looks super badass. From a function standpoint, it’s one of the better options – mainly for PvP. Providing two boosts to Fist of Havoc is great – and opens up some nice build options. But it’s a strength stat helmet, and melee on the Titan is terrible as it stands now. An Insurmountable Skullfort, despite a cool name and cool design suffers from that very fact. It’s boost applies to the Striker’s melee attack – Stormfist – giving you Transfusion from the skill tree. Unfortunately, melee is super dangerous in end-game PvE content, and in PvP, the Titan punch is very much on the bottom level of melee attacks. The last Striker helmet – Eternal Warrior – is new, added in with House of Wolves. It adds a boost to the Fist of Havoc, giving you Unstoppable, keeping you alive while pounding the ground. In PvE it’s got some use – swarmed by Thralls, this could keep you alive through the super. In PvP, it’s definitely more useful, and could work since you can take Unstoppable and Shoulder Charge. On the design front though, Eternal Warrior is up there with Helm of Inmost Light – it’s such a cool looking armor piece. For Defenders, you’ve got two choices, but really from a gameplay standpoint, only one. The Glasshouse, introduced in Dark Below isn’t a terrible choice, giving you Illuminated, making your Blessing and Weapons of Light buffs last longer. It’s got a cool design, but when you compare it with the other Defender helmet, it just doesn’t quite measure up. That final helmet – The Helm of Saint-14 – is probably one of two pieces of Exotic armor any Titan needs to get. It’s exotic perk blinds any enemy that wanders into your Ward of Dawn. In PvE it’s super useful for crowd control. In PvP it can actually make Ward of Dawn somewhat offensive in nature. 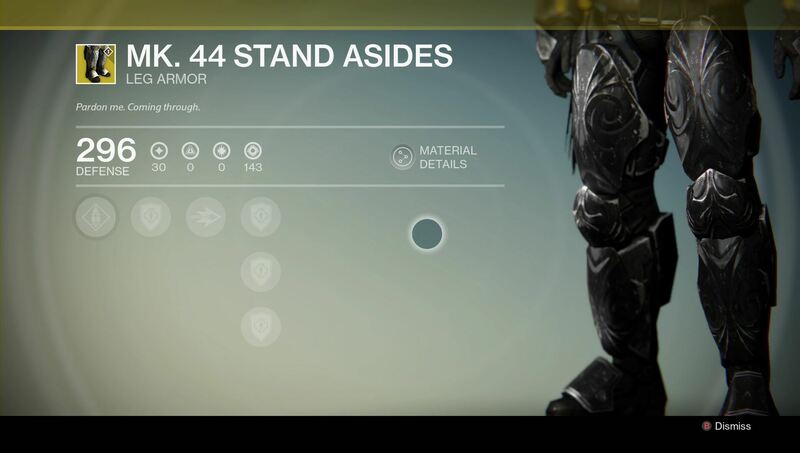 With a good stat roll, this armor can really make your Titan much more important to have on hand. Plus it looks pretty damn cool, giving you that awesome mohawk. For gauntlets, Titans have three choices to pick from. One for each subclass, and one that’s neutral. The Strikers have the ACD/0 Feedback Fence, which was added with House of Wolves. It gives you some area of effect damage when you take melee damage. In PvE it’s not as strong as I thought it would be. In PvP, it can get you a kill or two here and there, but I wouldn’t build a set-up around it. These do look pretty badass, taking material off of the Warsats we’ve been defending in Public Events since Day One. Defenders have the No Backup Plans, which suffer from a similar problem to the Skullfort helmet – they boost the melee ability. Longer lasting Force Barrier is nice, since you don’t need to get a kill for it to activate; but again, melee in end-game is super dangerous, and in PvP you’re giving up range to the other classes. The look cool, especially if you have a shader like the Jester Apogee to get purple all over, but form along won’t make me use them over Saint-14. 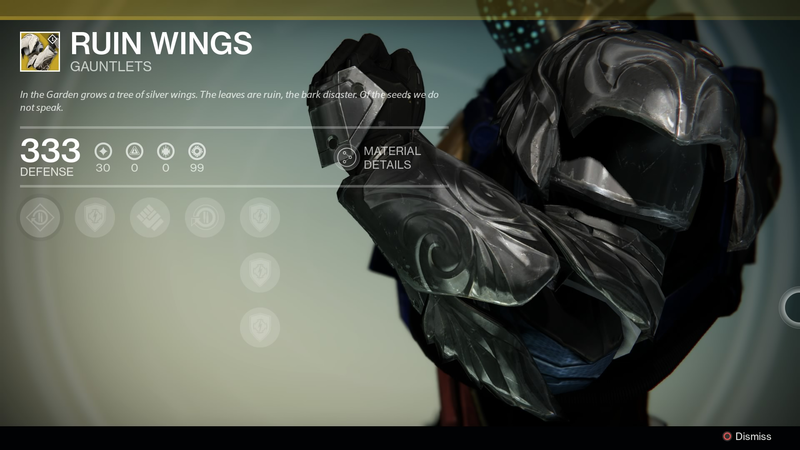 Finally, the subclass neutral choice would be the Ruin Wings. It’s great for PvE, giving you tons more heavy ammo drops, with more ammo in each drop. Now that Gjallarhorn was sold, and everyone will be using more heavy, these things are creeping up my usage list for sure. Add in that they look super badass, and pair well with a number of shaders/other armor pieces, and you’ve got a form and function armor piece. Chest pieces are where the Titans’ choices start to dip a bit. We’ve only got two choices, and they’ve been with us since launch. Neither is specific to a subclass, which makes them super flexible. 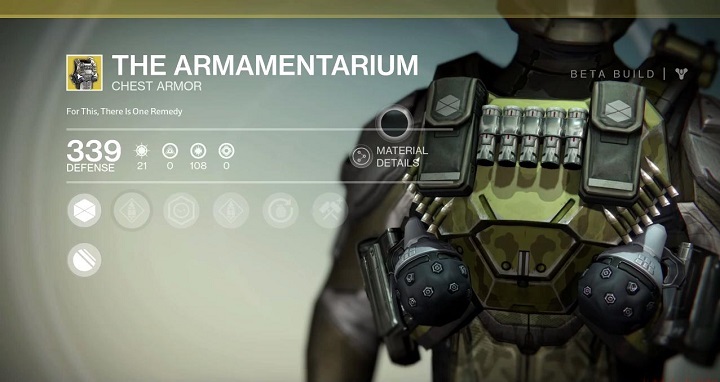 The first, The Armamentarium, is one of the better all around picks for a Titan to go with. Double grenades are awesome – for both PvP and PvE – and this also gives you extra special and heavy ammo. Sure it looks a little less Sci-Fi than other Destiny items, but it fits with the actual function of the armor. I have been rolling with this pretty much exclusively since I got one with a good roll. The other choice, The Crest of Alpha Lupi, is the teamplay choice for a Titan. In end-game, if you aren’t running Defender, that probably means Arc Burn is on; and it also tends to mean you’re probably making life harder than it has to be. Defender is definitely the better end-game choice, and with Alpha Lupi you can complete the support class build. Saint-14 might be the more useful choice in certain situations (Crota’s End, Prison of Elders, early in Omnigul), but Alpha Lupi lets you get revives while sprinting which is tremendously useful boost. It looks good with the bright crest on the chest, and pairs with a bunch of shaders too. Again, I just got a better stat roll on my Lupi, and I always have mine on hand for Nightfalls/Raids/PoE runs. Finally, we come to the leg armor slot. Again, we only get two choices, but that’s better than Warlocks here. They were both added with the DLCs, so we’ve had progress as the game has evolved. First up, The Dark Below gave us the Mk. 44 Stand Asides. These jet black leg pieces look super slick, especially when paired with my Revenant shader. Unfortunately, that’s about the extent of their use. Having three extra seconds of Shoulder Charge is a pretty lame exotic perk. I’ve said it plenty here, but again, melee is super dangerous in end-game content. So in PvE it’s definitely not worth it, while in PvP it’s technically more useful, since Shoulder Charge is a one-hit kill; but there are absolutely better choices. The other choice, the Peregrine Greaves, are brand new, added with House of Wolves. These also impact the Shoulder Charge, in this case cranking up the damage up three-fold, but only when fired in midair. With the right mission modifiers, this is actually worth using. It can take out Fallen Walkers in one shot, and even bosses can be felled quickly. They have a pretty cool design too, looking sleek, and pairing well with Bittersteel or Chatterwhite. Are they worth using – sort of; am I going to take them over other exotics – hell no. So there you have it – all the Year One Titan Exotic armor choices. We’ve got a whole bunch of options, spread over each armor slot. Of course, in practice, we really only have a few viable choices for end-game gear and PvP play. There are clear choices that are stronger than others. Saint-14, Armamentarium, Alpha Lupi and Ruin Wings are pretty much where you’re looking – anything else is pretty much just for messing around with, or needing to hit Level 34.